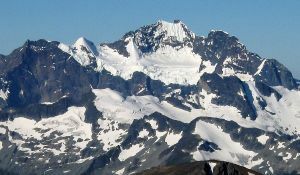 This peak is #37 in Prominence List for British Columbia .A massive mountain that dominates it surroundings, Saugstad was originally thought to exceed 11,000 ft because of its local prominence. A most distinctive mountain far northward possessed the odd symmetry of the end of a centre punch—dark walls rose nearly straight up to a snow-cap in the form of a flattish cone. Name Notes: Mt. Saugstad is named after the Rev. Christian Saugstad, who led the first Norwegian immigrants to Bella Coola in 1894.